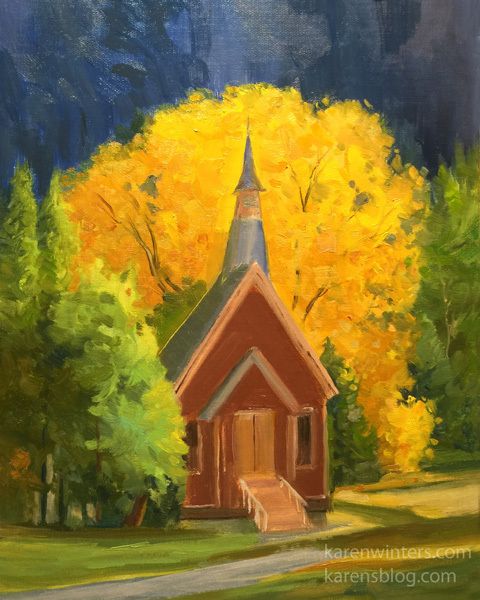 Autumn is one of the most beautiful times of year at Yosemite, and this little wedding chapel is never more charming than when framed with fall color. The deep afternoon blues of the walls are a perfect complement to the warm colors of the trees. I wonder how many thousands of weddings have been celebrated here? The view of El Capitan from the Merced River is one of my favorite sights in Yosemite. 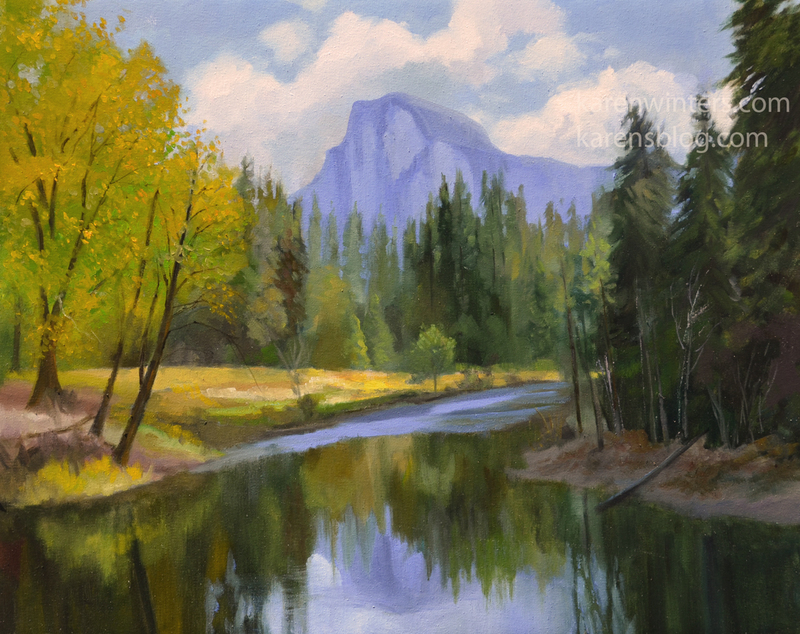 I always enjoy returning to paint there, any time of year. One of these days I’ll brave the elements and do a winter painting with snow capping the rocks. For now, the summer greens decorate the scene. A year ago, we had the opportunity to visit Yosemite Valley in the midst of a beautiful snowstorm. 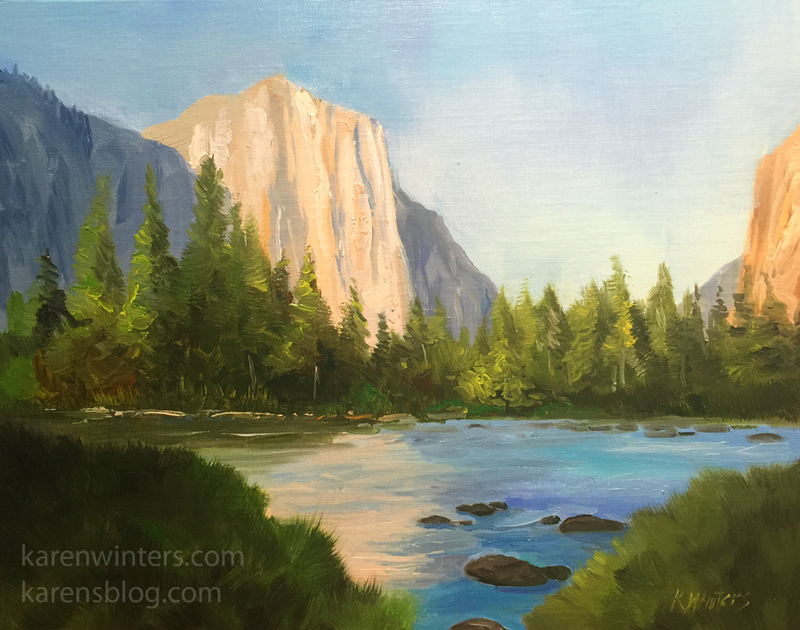 We stayed for four days at the Yosemite Lodge and enjoyed seeing the park at its most magical. 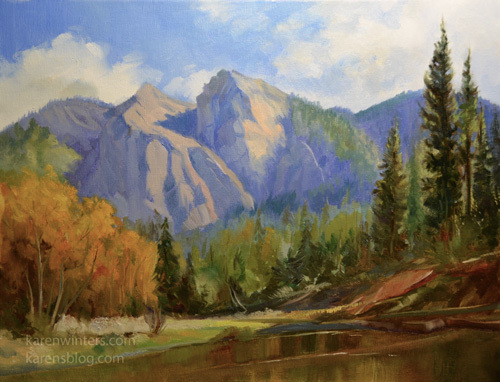 One morning, as we were hiking around, we came upon this scene where the sunlight had just come over the towering granite peaks to strike the new fallen snow. 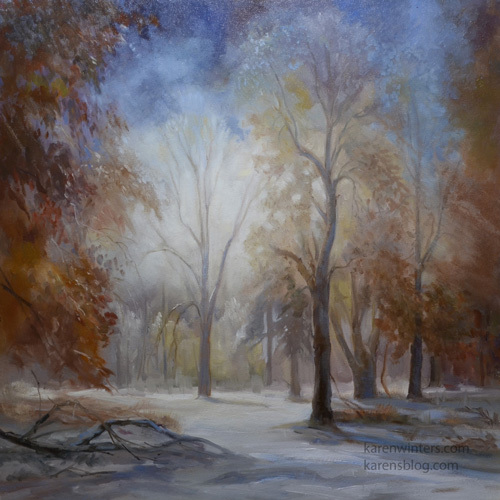 A soft mist began to arise and drift across the ground, while the bare trees glittered with frost. It was truly unforgettable, and something I’ve been waiting for awhile to paint. This painting was done last fall based on my visit to Yosemite. As many times as we’ve been there through the years, I’d never caught it at exactly this time, and it was certainly glorious. Cathedral Beach is on the left side of the Southside Drive, just beyond the El Capitan Bridge. It’s a popular picnic and swim area, with wide sandy beaches. 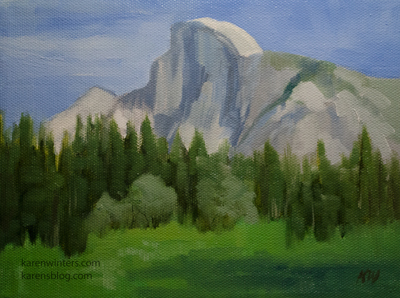 Almost everyone I meet in California knows someone who has climbed Half Dome or they’ve done it themself. In our family, my husband did the climb in college, and our son did it just a few years ago. It’s a rite of passage, and a beautiful one at that. I’m too squeamish about heights to attempt it myself, but I admire those who have. 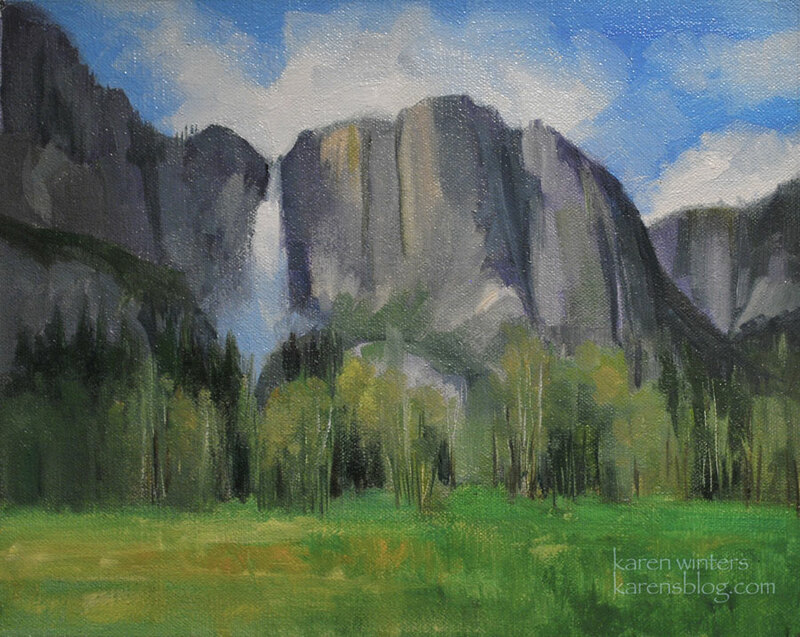 This little painting is the perfect size for a holiday gift, to commemorate a friend or family member’s climb to the summit. 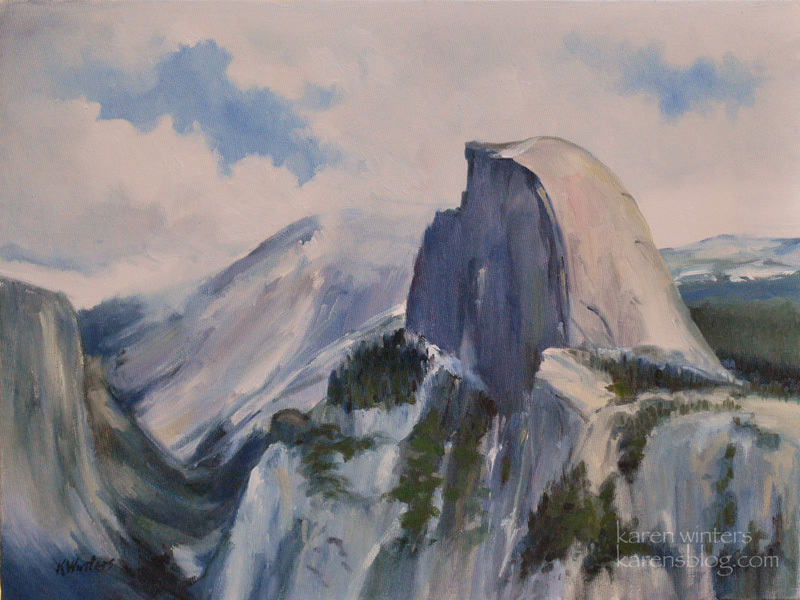 My husband and I have been visiting Yosemite since we honeymooned there (a very long time ago) and it never fails to captivate me, no matter the season or the weather. One of my favorite views is that of Yosemite Falls from the valley floor. The water is roaring more than ever this year, with the melting snow waters. With autumn on the way, it won’t be long before these peaks are snow clad again. We were told that many of the trees are going to be removed from the valley floor because their growth is obscuring the geological features that people come to see. I hope they don’t remove too many, though. The stately pines and deciduous trees add to the overall beauty of the park. 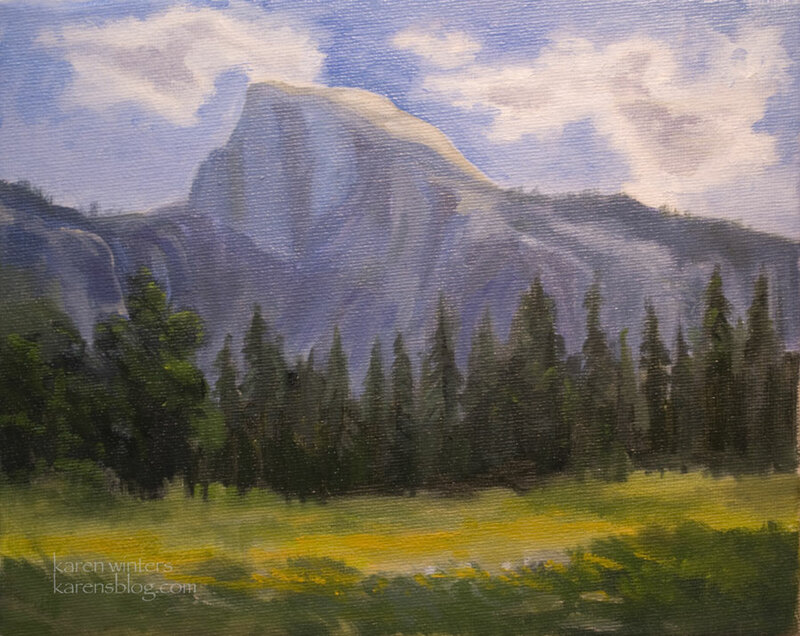 In the summer, Half Dome, the iconic representation of Yosemite (it’s even their park logo) rises about a meadow filled with marshy grasses and strewn with wildflowers. When we were there in mid summer, I noticed something moving not far from me in the meadow. Suddenly, a large mule deer stood up. He had four prongs on each antler so I guess that would make him an 8-point buck. After looking around and seeing us, he casually walked a few yards, then settled down again. I got a decent photo of him. Maybe I’ll paint that some day. 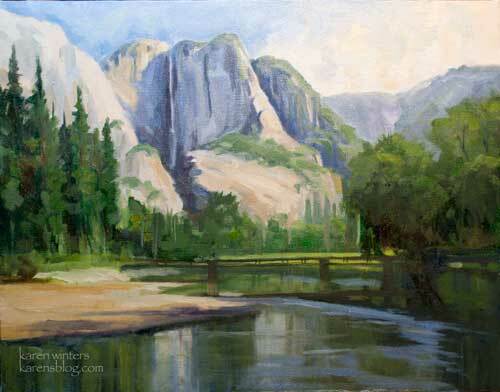 More of my Yosemite Paintings at this link. The Swinging Bridge across the Merced River in Yosemite connects the two sides of Yosemite valley. From the bridge, or a little south of it, where I was, you can see Yosemite Falls cascading down the granite face. Yosemite Falls is the highest waterfall in North America. When we visited, in the summer, it was not at its most intense flow, but it was impressive all the same.